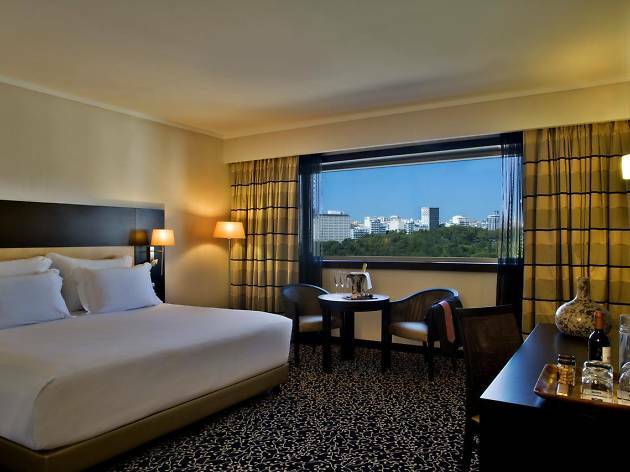 SANA provides a clean and comfy place to rest your head in Lisbon’s quiet northern suburbs. The hotel has easy access to the airport, so is well suited to business and leisure travelers alike. The SANA’s 265 rooms keep it simple with dark patterned carpet and crisp white linen. You’re pretty much guaranteed a prize view from the upper floors, with the Parque Eduardo VII or mighty São Jorge castle within peeping distance depending on which side of the building you’re on. For the business folk of the world, there are 16 executive suites on the 10th and 11th floors, which include daily newspapers, free parking, a Nespresso machine to kick your brain into action and a Playstation 4 for when your brain is fried. There’s also an early check-in option including breakfast, and a late checkout of 4pm. You can then go one better with a suite and have the luxury of a separate room with a dining table, sofa and TV, plus an extra bathroom, which is ideal if you need to host a business meeting in your room. Once you clock off you can hit the spa (which includes a hot tub) and get your zen on in the sauna or steam room. The Contemporâneo Restaurant is all about traditional Portuguese cuisine and other European flavours and serves a buffet lunch from Monday to Friday. 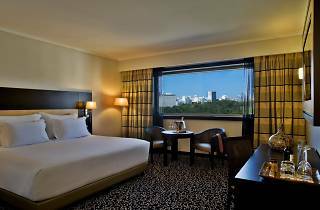 Location: The hotel is positioned just outside Lisbon’s historic centre so you may feel a little out of the downtown action, but the Parque and Marquês do Pombal metro stations are both a five-minute walk away. It’s a ten-minute walk to the start of Lisbon’s high street, Avenida da Liberdade. Campo Pequeno Stadium: This is the official home of Portugal’s bullfighting scene. Even if you’re not into the gory sport, the red-brick building is a spectacle in itself, and you can catch other events here or wander the shops and food court downstairs. El Corte Inglés: Lisbon’s major department store stocking high-end brands of clothing, accessories and homewares is located one kilometre away. The supermarket downstairs shelves a wide variety of goods, including international foods. Miradouro do Parque Eduardo VII: This lookout is located on the border of the park named after one of Portugal’s most famous fado singers, Amália Rodrigues. From here you can admire a sweeping city view across the manicured gardens. O Talho: O Talho means ‘the butcher’, which should give you a clue as to what’s on the menu at this restaurant by well-known Portuguese chef Kiko Martins. There is in fact also a butchery onsite. Good for: Executive rooms cater well for business travellers, and if you’re bringing the kiddies, a babysitting service is available. Time Out tip: While small, it’s worth poking your head into the beautiful palace of Sotto Mayor, which is a quiet attraction just a two-minute walk from the hotel.